Should you Trust Numbers in Casino Games? When players are on the casino floor, many disregard facts that they may accept outside of the casino in favor of gut-based play. If, for example, you’re playing roulette and the ball just landed on red six spins in a row, where would you place your next bet? If you said red, because that’s the hot color, or black, because a switch is due, then you’re relying on your brain’s pattern-sensing abilities to guide your betting habits. While this is just fine for having a great time, believing that either color is more likely based on the results of previous spins is a classic misconception known as gambler’s fallacy. Gambler’s fallacy is a common misstep in casinos, because people are hardwired to find patterns, even when they don’t exist. While some games, like blackjack, have a slight variation in odds from game to game, roulette, craps and slots don’t subscribe to this rule. In reality, roulette wheels are never ‘due’ to land on a certain color or number. Each and every spin, the ball has a 48 percent chance of landing on red. Over the long term, the wheel should, statistically, post relatively even results, but that has no effect on the results from one spin to the next. 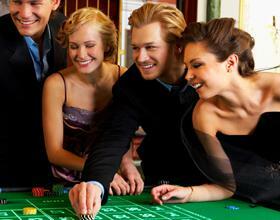 So, how can you avoid gambler’s fallacy and maximize your fun at the casino? The best way is to trust the numbers. Instead of looking for a hot slot machine that’s ready to pay out, just find a machine that suits your interests. Modern slots utilize a little device known as a random number generator that ensures each and every spin has the same odds as the one before it. When you’re preparing for your trip to the casino, this fact is pretty easy to comprehend, but most players disregard it when the money is actually on the line. Luckily, gambler’s fallacy also negates itself in random games such as roulette. Whether you bet on red because you think it’s due or because it’s your favorite color, the results will be the same. As long as you stick to the conservative outside bets, you’ll be fine. However, gambler’s fallacy does highlight one significant problem that some gamblers face: they don’t trust the numbers. While fancy lights and dinging bells may be enough to hypnotize your senses, the numbers never lie. If you want to have a great time at the casino, keep the numbers in mind. Play the odds, and you could be walking away as a winner. Bets like red, black, even and odd are great ways to put your luck to the test, but it’s important to remember that luck is the only variable at play. No matter how much you may feel like the next spin will definitely land on black, the results will be completely random. So, can you trust the numbers in casino games? Absolutely! While game developers are masters of creating interesting graphics and distractions to draw your attention toward other things, the numbers are the heart and soul of every casino victory.